In 2015, social media is no longer just mainstream. 2015 Social media’s audience is mature in more ways than one. Social media is not only mature in terms of its life cycle but also in terms of the age of participants. 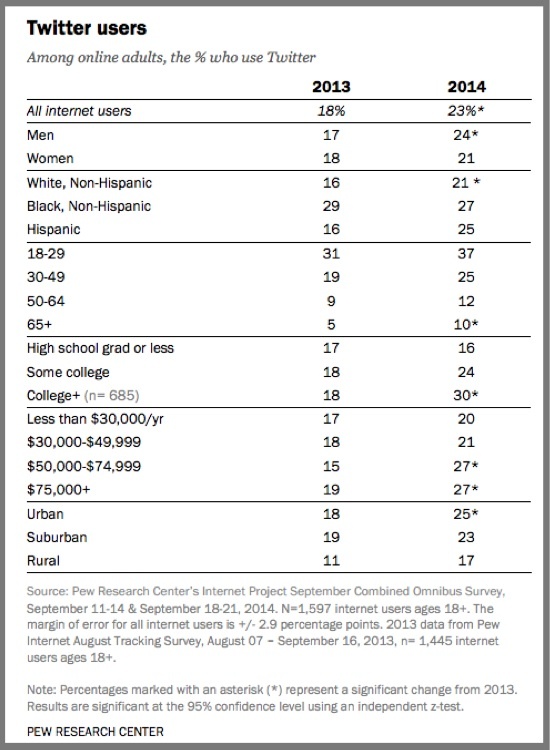 71% of US Internet users are on Facebook. Unlike other social media platforms that experienced high growth during 2014, Facebook’s proportion of Internet users remained flat with August 2013. Primarily, people use Facebook to connect with people that are important to them in real life; who they view as peers with whom they’ll share unfiltered information. Hence the lower results for parents and children. As with other forms of social media and communication, Facebook attracts more women (77%) than men (66%). 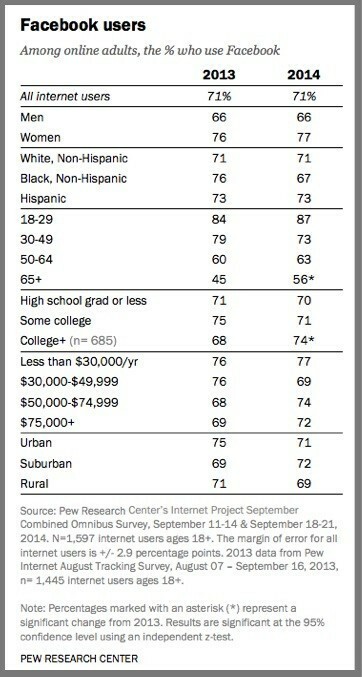 Facebook’s composition by age is getting older. It’s important to note that this research doesn’t measure “Under 18 year olds,” the key social media demographic. As we said in 2013, Facebook is no longer the cool social media kid on the block. Facebook is retaining its mass social media audience. It’s an important element of your social media and content marketing plans because of its reach. Marketers must still aggregate a variety of third party platforms to match television’s reach despite its declining advertising effectiveness. Keep Facebook in your social media marketing mix. Sorry, but size counts. That said, tailor your content and interactions to your Facebook followers. Use targeted Facebook advertising to reach key prospects. Don’t just boost your posts. Take advantage of Facebook’s targeting potential. Check out Jon Loomer’s blog for specifics. While the percentage of college educated Internet users using LinkedIn reached 50%, in general, LinkedIn users are visiting the social media network less frequently. 7% of LinkedIn users visit the social media platform several times a day. 61% of LinkedIn users visit the social media platform every few weeks or less often, up from 52% in 2013. This reduction in LinkedIn visit frequency points to the use of LinkedIn mainly as a job search tool. It overlooks LinkedIn’s expanded power as a publishing platform and lead generator/business driver. In our 2015 social media predictions, we call LinkedIn, the must-be destination for businesses of all types. Leverage the power of your employees on LinkedIn. Don’t be afraid of making your employees look good on LinkedIn for fear of losing them. Instead think in terms of attracting more business, customers and employees. Pinterest is social media honey that attracts women. 42% of online women use Pinterest and 13% of online men use Pinterest. This shouldn’t be surprising since it’s the home of couch surfing for shopping inspiration. 9% of Pinterest users visit the social media platform several times a day. 52% of Pinterest users visit the social media platform less than once per week. 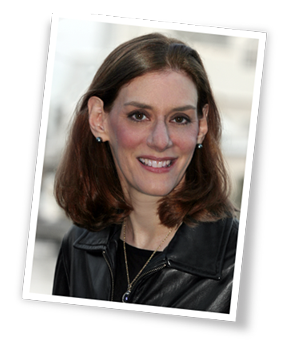 Underestimate Pinterest’s ability to pull in shoppers and readers at your peril! It’s BuzzFeed’s number 2 source of social media traffic!!! Curate your content marketing on Pinterest, regardless of your business type. Take your cue from BuzzFeed. Make your content alluring with pin-friendly images. Display your products on Pinterest where appropriate. Don’t forget to show prospects how to use your products and to show them in context. Redirect Pinterest traffic for products that you no longer sell. Bear in mind that prospects may be looking at old pins. 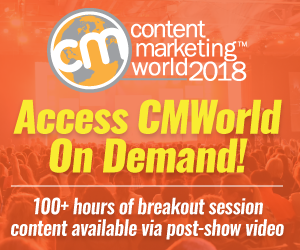 Social media marketers should pay attention to Instagram because it’s unlocked the secret code to interaction. In 2015 and beyond, this playbook will be re-written for video, which people find easier-to-understand. Make your information visual, useful, consumable, and shareable on a smartphone. 49% of Instagram users visit the social media platform daily. 26% of Instagram users visit the social media platform less than once a week. Don’t assume that Instagram is just for consumer products. General Electric has been one of the early businesses to leverage the visual power of its B2B products and customers. BTW, here are 4 key types of visual content marketing using Instagram. Make your products and customers Instagram-friendly. Encourage your customers to share their images. There’s nothing stronger than seeing other consumers wearing or using your product. Find the visual beauty in every aspect of your business. Think how you would explain your business to someone who had never seen before. 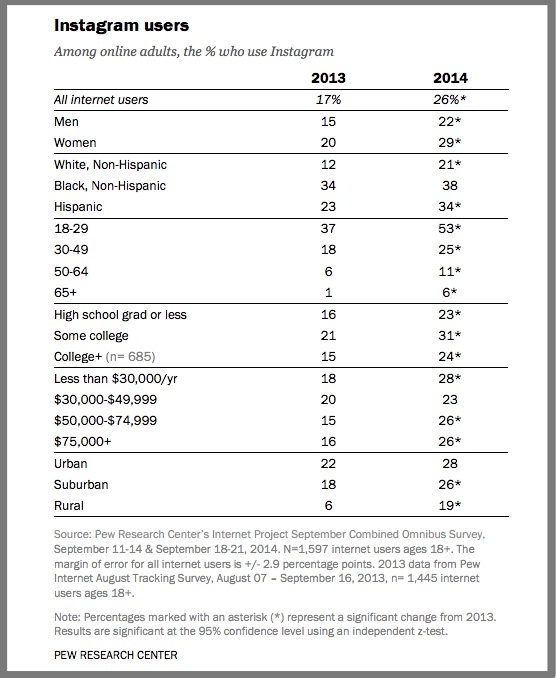 23% of US Internet users are on Twitter, up 5 percentage points from 18% in August 2013. 36% of Twitter users visit the site daily, down 10 percentage points from 2013. 22% of Twitter users visit the site more than once a day. 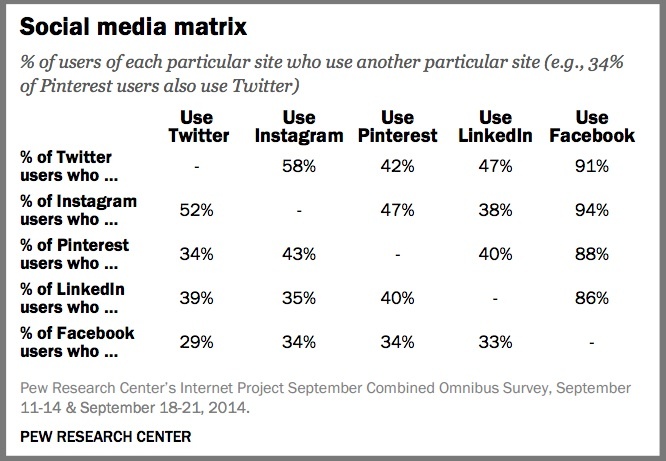 40% of Twitter users visit the site less often. Twitter continues to grow, but at a slower rate. Further, the combination of short message longevity and limited participation, translates to publishing your Twitter content when your audience is active and to publishing your content more than once. Here are 27 super easy tactics to boost your Twitter strategy. Here are charts explaining Key 2015 Twitter Trends. Take the time to understand your target audience’s use of Twitter. The goal is to maximize your ability to reach your prospects when and where they’re focused. Slice and dice your content for Twitter. Your aim is to present your content differently to reach the maximum audience possible. 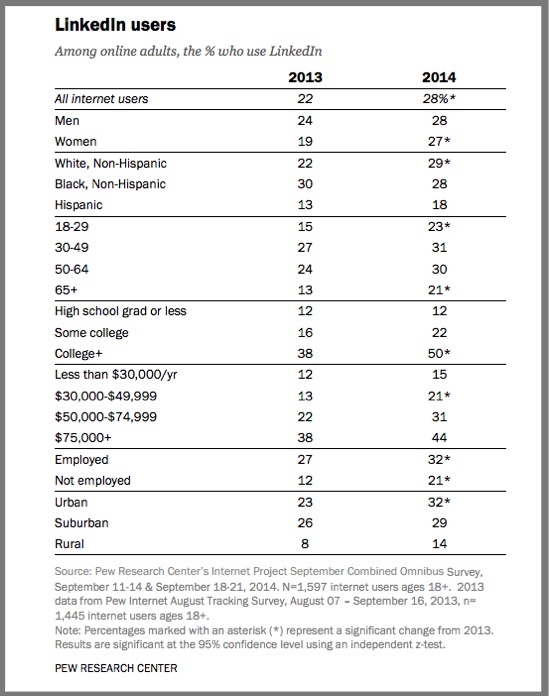 Multi-platform use is on the rise: 52% of online adults now use 2 or more social media sites. This is a significant 10 percentage point increase from 2013. 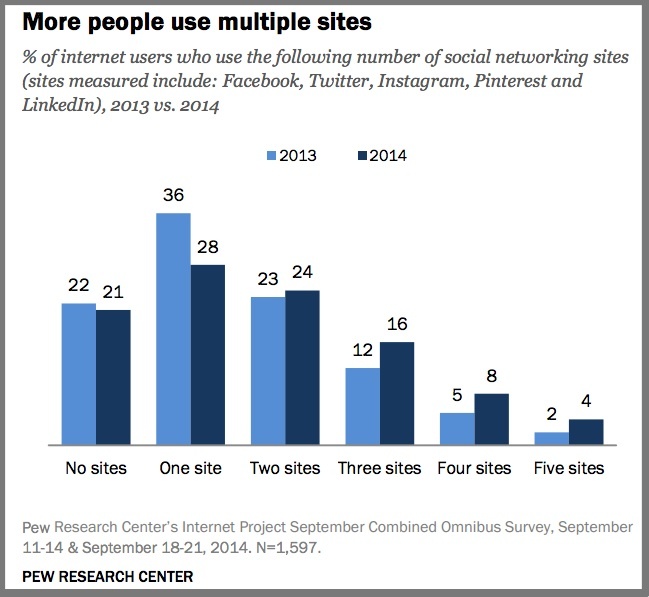 79% of social media participants who use only 1 platform use Facebook. The percentage of Facebook users who also participate on another social media network has increased since last year. 94% of Instagram users also use Facebook. This is attributable to Facebook’s ownership of Instagram and to easy ability to share events via photographs with people participants are close to. In terms of non-Facebook social media interaction, there’s significant overlap between Instagram and Twitter users. This is also attributable to the easy ability to broadcast your activity to others. 58% of Twitter users also use Instagram. 52% of Instagram users also use Twitter. The bottom line: social media is here to stay. Marketers must figure out where their audience is on social media. Then they must develop strategies to create tailored social media content and distribute it by platform. To maximize your results, schedule your activity using a social media editorial calendar. 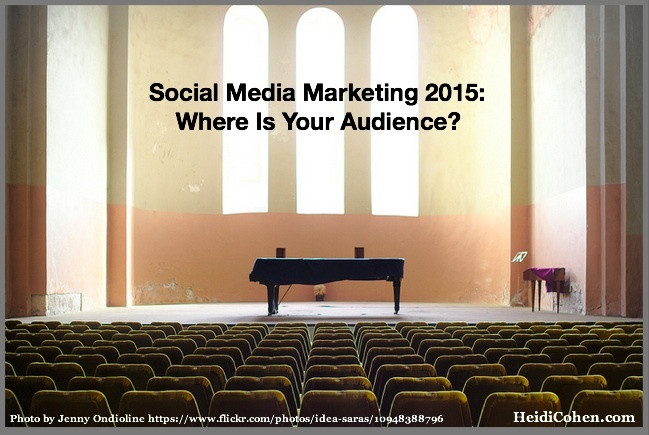 Where is your audience on social media in 2015 and what are you doing to engage them? BTW–Here’s the Ultimate 2015 Marketing Checklist to download. Tags Facebook, Instagram, Jon Loomer, LinkedIn, Pew Research Center, Pinterest, Twitter. Bookmark the permalink. 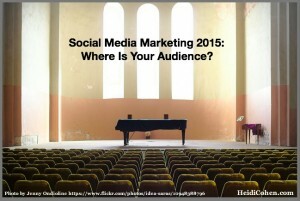 4 Responses to Social Media Marketing 2015: Where Is Your Audience? Thanks for sharing Heidi! I’ve always been convinced of Facebook’s relevance but the 93% statistic jumped out at me. 93% of people are friends with people other than their close family and friends? That’s great news for business. try social media is the latest technology that pays every user activity such like, comment and share …. let’s register. click the following link and fill out the registration. Lets Join with us tsu social metwork, and make money !! Great post, Heidi. Interesting that there are more men on Twitter than women. Great data. The social media team at our Charlotte digital marketing agency have this info already, or I’d share it with them. Very good.